Last summer, I blogged on some of the novels that I write about in my thesis; this came to a halt in the final months before submission, but now I’m approaching my viva it’s a good time to be picking up the books again and getting my mind back into the right place. 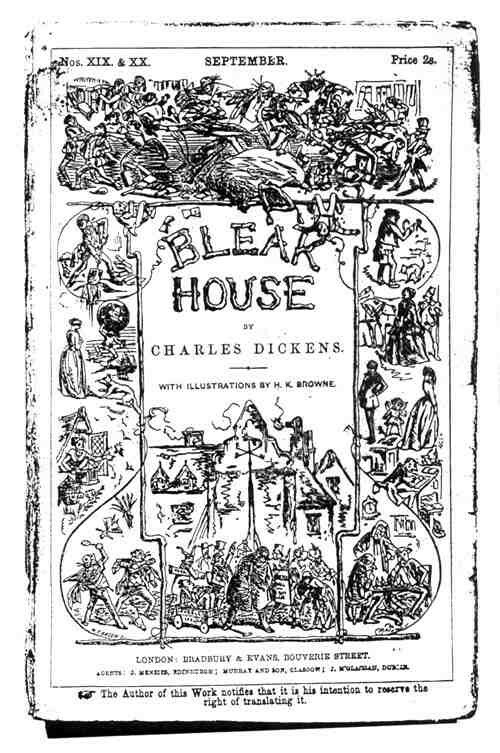 Bleak House was a novel that I came to at a relatively late stage of my PhD, but quickly played an important role in my first chapter on issues of space and mobility in Victorian fiction; the novel draws out some key connections between mobility, space, and capitalist modernity that are undergoing fundamental reconfigurations at this time. Like many novels of the period, Bleak House is set before the coming of the railway – towards the end we see plans and preparations underway, ground staked out demarcating the new spaces the railway will construct. In terms of its geographical movement, too, Bleak House encompasses a relatively small spatial field (as I noted with David Copperfield): from the novel’s epicentre, London, the movements take us north to St. Albans and Lincolnshire, and south to Kent and Paris. India, Africa and Paris are there on the margins of the text, but as imagined spaces-away rather than occupying a substantial narrative presence. Yet whilst not seeming to be hugely concerned with issues of modern mobility, throughout the novel the implications of the modern, mobile condition and the spaces produced by capitalist modernity are repeatedly played out. Indeed mobility is there right from the very first lines of the novel – not, as tends to be remembered, the image of fog pervading the city, but rather with foot-passengers jostling through the muddy streets, “adding new deposits to the crust upon crust of mud, sticking at those points tenaciously to the pavement, accumulating at compound interest”. A wonderful image in its recognition that space is on-going, lived, produced; and, crucially, produced through mobility. From this point in the novel, mobility is present in such a way that the novel’s commentary on social relations becomes a commentary, too, on the mobilities produced by – and, crucially producing – those social relations. Many critics have noted how Bleak House is constituted from rich and complex networks of social interactions, with characters from all levels of society constantly becoming connected and inter-connected in interesting and unexpected ways as the narrative unfolds. But to me it’s not so much the narrative networks that form the interest of the novel, but rather that the novel is also intensely preoccupied with the movements between those social interactions; the mobilities that produce that network and that reveal both the indiscrepancies and the possibilities inherent in such a system. In my thesis, I focused on how the novel plays out a commentary on the social inequalities produced by modernity through two instances of classed mobility: Jo the street-sweeper who, “moving on and moving on” through the streets represents the constant, enforced mobility of the lowest social order; as contrasted with Tulkinghorn whose journeying is so effortless that he does not so much travel as simply appears from one place to the next, “he walks into Chesney Wold as if it were next door to his chambers, and returns to his chambers as if he had never been out of Lincoln’s Inn Fields […] he melted out of his turret-room this morning, just as now, in the late twilight, he melts into his own square”. Unchanged by his journey, simply seeping through space, this effortless mobility demonstrates command over space and hints at the possibilities of modern mobility which will, if not utterly annihilate, at least extensively transform the relationship between space, time, and movement. Here then, the novel’s critique on social inequality is played out in such a way that more specific connections begin to be made with capitalist modernity and the spaces it (unevenly) produces. In writing about Bleak House previously, I’d also noted a number of other ways in which mobility is presented: Woodcourt’s travel to India as a ship’s surgeon, or the brickmakers “on the tramp” from Hertfordshire to London. But what really struck me on this reading was just how pervasive mobility is throughout the novel: nearly – if not every – character is at some point discussed through reference to their mobility, from Mr Rouncewell the ironmaster who is “always on the flight”, to Miss Flite who “thinks nothing” of walking from London to Hertfordshire to visit the sick Esther, Mrs Bagnet who is the most “fresh and collected” of travellers at all times… and numerous other minor, as well as all of the major, characters are in some way constituted through their mobility. In terms of the representation of social relations, this draws out numerous different facets and meanings of mobility, constructing a rich and varied field of mobile possibilities that demonstrate both the inequalities and the possibilities of the new, mobile condition; different types of mobility thus offer a different perspective on the novel’s commentary on social status. But taking a step back from this, what I think we’re also seeing here is a recognition of just how crucial, even fundamental, mobility is; this prevalence of mobility through every strand of the narrative’s networks recognises that mobility is intrinsic to modernity, not only in that different types of mobility offer means of commentary on social status, but further, that the mobilities that constitute, enable, and are produced by these networks, are essential and central to the modern condition. Whereas other novels offer illuminating representational instances of mobility, Bleak House is unique in just how saturated with mobility it is, its narrative structures residing in a fundamental preoccupation not only with the networks of social relations, but more importantly the mobilities through which those networks are lived and produced. Bleak House has cropped up a lot recently in discussions of TV series such as The Wire which are similarly structured around complex networks of social relations, and I’ll be interested to think more about how this idea of mobility producing the network – as the network itself, even – figures in contemporary articulations of the narrative network. Just a quick post after this caught my eye in the Guardian last week – the “maps” of photographer Sohei Nishino, who collates thousands of photos of cities into a diorama. The effect is a fascinatingly detailed and intricate vision of the city, and I particularly love how the final image seems to play with its own un/reality; both suggesting “reality” in using close-up photographs that attempt to capture every miniature truth of the city, yet constantly revealing its own artifice in the patch-work effect that results from collaging each individual photo, creating a jarring from the joins between multiple fragments. The visual appeal, I think, is one of fascination from the continual visual readjustment that the image demands; from a distance, the strangely familiar yet oddly fragmented image draws one in for a closer look at the individual pieces, yet in looking closer I almost immediately want to move back out again, realising that the detail is made meaningful only in contemplation of the whole. And so on. All this, however, is only from the computer screen – I’ll hopefully visit the Museum of London’s exhibition of London Street Photography to view this, and what sounds like a wonderful collection of other street photographs on display there.